[Destination]: Less, Part I | by.choice.not.chance. Well, here I am at Day 2 of my Spending Freeze month, and it’s going pretty well. It’s actually been pretty funny. As I’ve been cleaning out my dining room today, I keep thinking about things I could buy in order to help me organize several rooms a little better. Hmm, kind of defeats the purpose of a spending freeze, but at least I haven’t acted on those impulses! I’m realizing more and more that this challenge will be a difficult one for me. While cleaning out is good, I very much have the tendency to purchase things to “fill the void” that the now well-intentioned, donated item has left. Sad. So very sad. Does anyone else have this problem? However, I’m also finding that creating more space in my home and finding a place for everything that does belong there is causing me to create more space in my mind. (I honestly thought there wasn’t anymore room up there.) I’m feeling more free emotionally, physically and spiritually, all just from getting rid of the clutter in my life. Just after cleaning out one small room…miracles do happen! I read this quote by Karen Kingston in her book Clear Your Clutter with Feng Shui, and it really struck a chord: “Life is constant change. So when something comes into your life enjoy it, use it well, and when it is time, let it go. Just because you own something, it doesn’t mean that you have to keep it forever. You are just a temporary custodian of many things as they pass through your life.” A temporary custodian; anyone else feel that like a smack in the face? DUH! How many times does the Pastor have to say it? How many times do you have to see it from friends and family who have passed on? You CANNOT take all the stuff you accumulate with you to wherever your afterlife leads you! So why let it bog us down, cause us depression, anxiety, weight gain, and destroy our quality of life? (And if you think it doesn’t do all of those things, I’m here to tell you that it does. Take a close look at your own life to evaluate if that’s happening in your home.) Yes, our acquired possessions connect us with many different things. We associate them with memories, people, relationships, seasons and different events that have happened to us. But just because we rid our lives of the excess that those possessions causes doesn’t mean that the memories we hold dearly will leave as fleetingly as the item we’re donating, selling, or throwing away. Are you afraid that you might forget those all-important memories one day? Fair enough; we all might. But there are many ways to document those times. Think you don’t have enough hours in a day to do something like write your memories in a journal or take pictures of your things and write down why they’re important to you? Start with just setting 20 minutes per day aside and see how far you get. Make a scrapbook. Then, make sure that book has a place of it’s own. I’m writing this all from just two days of decluttering. Two days! It seriously does feel as though I can breathe a little easier. I’m slowly starting to put things into practice (such as a regular cleaning routine…which I’ve never successfully had…ever…in my life) that I’ve been wanting to do for a long time. My sister will tell you that I’ve never wanted to clean a day in my whole life, and while I can’t say I’ve desired to clean, I would like to keep my house in a working order so that I don’t feel embarrassed to invite people over on a whim. I’m getting so much closer! Item number 2 on my to-do list today is to write out some recipes that my family enjoys eating. Once I do that, I’ll start pairing items I have in my pantry, refrigerator and freezer to those recipes and trying some substitutions if I don’t have something. Then, the menu planning begins! It’s starting to scare me how much I’m enjoying this whole organizing/spending freeze. But hey, who knows…you might just like it as much as I am starting to. Give it a go. Again, you’ve got nothing to lose! I challenge you today, perhaps before you go to sleep tonight, to write down one thing you want to do tomorrow towards decluttering your life. 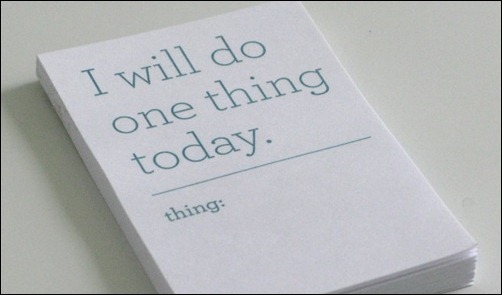 Then, set aside just 20 minutes to do that one thing. That’s giving up less than one TV show tomorrow. If you don’t get the entire thing done, don’t worry about it. Just spend 20 minutes on it. Set a timer if you have to. And, let me know how it went! Here’s to finding less in your life so you can enjoy the important things more! This entry was posted in Organization and tagged decluttering, organizing, ridding excess by michellebreon. Bookmark the permalink. Pingback: [Destination]: Clean Laundry | by.choice.not.chance.